Preheat the oven to 425°F (220°C). Cut the figs into quarters but not all the way through. Arrange, quite tightly packed, in an ovenproof dish and drizzle with the honey. Roast in the top of the oven for about 10 minutes, basting once, until they just begin to brown. Remove from the oven and chill as quickly as possible. Set aside the 4 firmest or nicest figs, with a little of the juice from the dish, to serve later. Scoop the flesh of the rest of the figs into a bowl with the rest of the juice, and blend to a smooth purée. Add the remaining ingredients and blend until smooth. Transfer the mixture to an ice cream maker and churn according to the manufacturer’s directions, or put into a freezer container and freeze using the hand-mixing method. When firm, freeze until ready to serve. 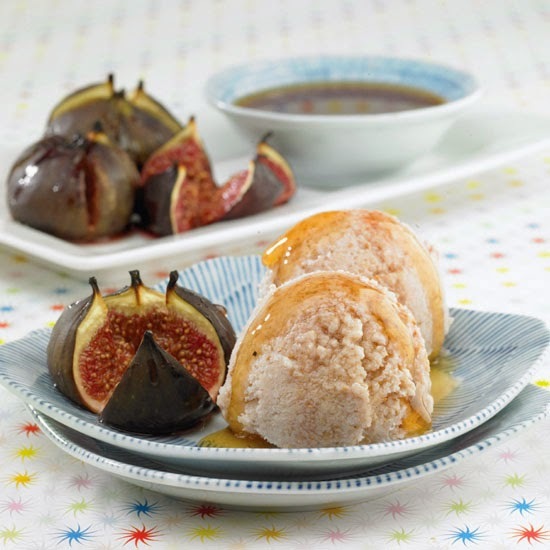 Top each serving with a roasted fig and a drizzle of the juices. Prepare the basic recipe, replacing the figs with 3 ripe pears, peeled, cored, and quartered before roasting. Save 4 pieces of pear for serving. Replace the figs of the basic recipe with 3 ripe quinces, peeled, cored, and quartered. Add the juice of 1 orange when roasting the quinces, and roast them until tender, about 20 minutes. Save 4 pieces of quinces for serving. Prepare the basic recipe, replacing the figs with about 24 pitted, dried prunes. Serve the ice with 1 or 2 roasted prunes per serving. Prepare the basic recipe, replacing the figs with 12 large ripe pitted apricots.